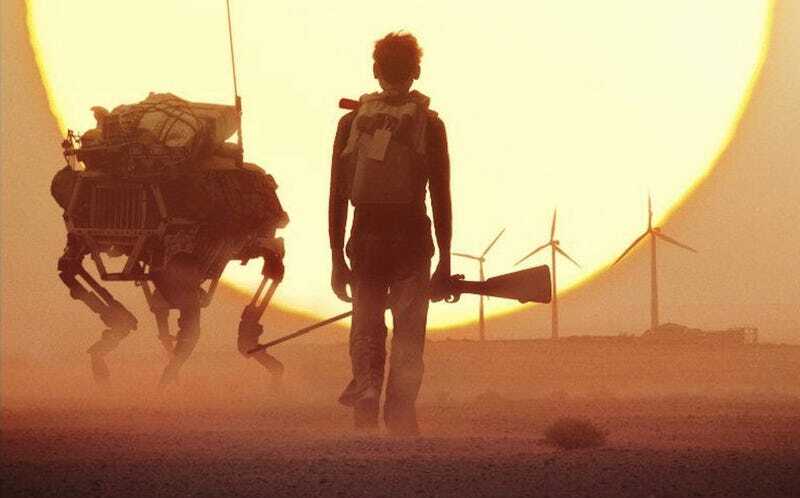 Young Ones, from writer/director Jake Paltrow, is basically a post-apocalyptic Western, which takes place in a dark future where water shortages have turned the landscape into an arid dustbowl. A farmer named Ernest Holm (Michael Shannon) discovers that his well has finally run dry — and that's just the beginning of his problems. His trusty mule dies, and he's forced to buy a stumbling BigDog-style robot to replace it. And then he starts running into trouble with his daughter's slimy boyfriend Flem (Nicholas Hoult). Without going into too much detail about the movie's plot, it's basically a very dark Western in which murder and skullduggery abound. The most sympathetic character in the movie is Ernest's teenage son Jerome (Kodi Smit-McPhee), and it should be no surprise that Jerome's innocence gets completely destroyed over the course of the film. Meanwhile, Ernest's daughter Mary (Elle Fanning) never quite loses her romantic illusions about the cute-but-horrible Flem. There are a few bright spots in this film, but you will mostly just want to gargle battery acid after watching it — it's pessimistic in a way that few post-apocalyptic films are pessimistic. Because it has a really bleak message about our future of environmental devastation, and about human nature. In one of the film's best scenes, someone observes that we always heard that those who forget history are doomed to repeat it — but it turns out there are worse things than repeating history. What makes this movie so compelling is its vision of a world living with a water shortage. A future where you have to wash your dishes with dirt. Paltrow does a great job of creating a world that feels lived-in and plausible, and horribly unforgiving.The dusty, dry landscape is beautifully shot, and looms in the backdrop of every laconic, brutal scene. You feel in your bones how vital water is to our survival, and how horrible the world would be without it. And first-time director Paltrow is clearly trying a lot of ambitious things in this movie, visually. The use of color is really startling — like in one scene where Mary spills her nail polish on the family's newly-bought robot, and the camera lingers on the bright polish on the dinged-up robot. There's also an ambitious shot that pulls back from a tragic scene through a picture frame, back into the gaze of someone looking at the scene in a picture later. Speaking of the robot, its stumbles and body language are used to maximum effect, and Young Ones is a great example of using science-fiction elements as storytelling tools, and making science-fiction world building feel potent as well as poignant. Young Ones is not a perfect film, at all — it drags a bit in places, although some of that is necessary to sell the feeling of deep despair in the movie. And the characters are all a bit too one-dimensional, even as archetypes — and you may want to throw something at the screen at times, seeing how self-destructive and silly these people are. I can see why some people gave this film muted reviews at Sundance, even though I liked it a lot more than they seemed to. Bottom line: Young Ones is not an easy film to watch, but it is a thrilling and disturbing look at people living on the edge in a dry world. It's the kind of futuristic storytelling that works both as a cautionary tale and as an example of how to imagine a future that feels real and human-scale. It's definitely worth checking out.